I headed south last Saturday to visit some waterfalls in and around the Opal Creek Wilderness. I have a pretty big list for this area so I wanted to make a dent in it over the weekend. First on my list was Evans Creek Falls north of Elkhorn. While driving up Evans Mountain Rd. SE I ran across this pretty good sized waterfall on unnamed drainage. About 25ft tall between the two tiers. After grabbing a few pictures Melinda and I got to the point in the road that I thought was the quickest way to the falls. It looked really steep and we were so far away from the river that I thought we should try an old logging road that I spotted lower on the hill. I thought it might be an easier route. We followed the old road for quite a while and it eventually went right down to the creek. We didn't even have to bushwhack very far past the old road as we approached a bend in the creek and we could hear a waterfall. In no time we saw our goal. It looked to be about 50 to 60ft tall. This was way too easy. Getting a closer look was quite a task as we had to cross the creek and make our way up the other side. Not a lot of footing. Finally as I got closer to the waterfall something didn't look right. This wasn't the waterfall we were seeking, it was the unnamed creek that we saw the waterfall at earlier. This waterfall looked like it was the source of the creek from where we were earlier. Still it was a nice waterfall. So this not being our goal I knew we had to go up the creek a little further. It was still early in the day so onward we went until we got cliffed out. We backtracked a ways and crossed the creek again on a fallen tree. we got further upstream but got cliffed out again. Now we had to go up a very steep grade about 100ft above the creek so we could continue upstream. Now I was wishing I had dropped down from the road above. As we came up in another bend in the river we could hear a waterfall...and this one was louder than the last. Yay, we found Evans Creek Falls. Premature "yay" After an extensive search of the area I realized that the whole area was cliffed out and there was no way to the base of the falls without climbing gear. This waterfall is big...around 80-90ft tall but the only view is blocked by a couple of trees at the base of the fall. It may be possible to reach the base by walking through the creek at a lower flow at the end of the summer. We were both kind of bummed but glad that we got here and saw what we did. Melinda didn't want to go back the way we came so we headed up the hill towards the place I originally was going to start. A short way up we came across an old logging road in good shape and we hiked it up to the paved road. Wow...it dumped out right across from the first waterfall that we saw earlier in the day.....very funny. We were on the wrong side to see a view or get to the base of the falls. So back up the creek we went, looking for a way to cross. On the way up I stumbled on some rock work from an old road that crossed the creek. It must have been a pretty neat bridge. No where to cross but up at the road. Amazingly there was a trail down on the other side, yay. A view from the old road looking at where a bridge used to be....from the west side. We made it to the waterfall and while descending to the base I noticed something really cool, a stone arch. Finally....a great view. The other Triple Falls. This waterfall got my approval. It was starting to get late so we were looking for somewhere to camp and we noticed the road to Shady Cove was open. We headed down and found an empty campground. We decided to see one more waterfall before making camp. Sullivan Creek Falls was flowing good. After a long day it was nice to relax. Chasing waterfalls can be addictive. We got a good night sleep and headed out to see more waterfalls. We were both feeling beat up and sore so we were planning on some easy waterfalls. We crossed the bridge and headed back up to Sullivan Creek Falls. 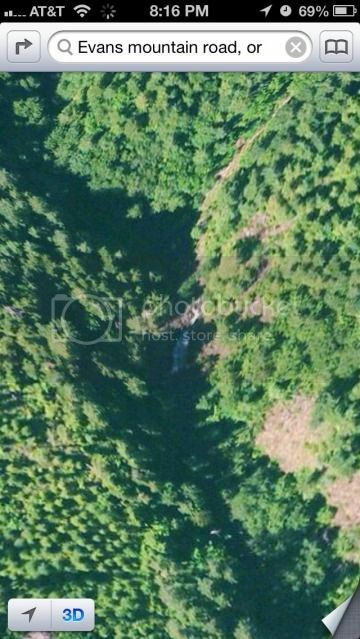 The Little North Santiam River looks beautiful here. A couple of miles up from Sullivan Creek Falls we passed this roadside unnamed waterfall. A little farther up the road we found snow..and a nice place to turn around. Not going to play the stuck in the snow game today. We stopped off at the old Pearl Creek Ranger Station on our way out. Looking for something easy we stopped by the side of the road to get a picture of Horn Creek Falls. Melinda felt like going to the base but we wanted to hike out to Jawbone Flats. We agreed if we had time to get down there we would on the way back. Horn Creek Falls. We got to the trail head and surprisingly there were not a lot of cars. It was a great day for a hike too. Off we went to Jawbone Flats. Some of the machinery from the old mill. This river is really beautiful. Even at a high flow it is still clear and not all cloudy. We made it to Cascade de Los Ninos or Sawmill Falls. It was raging today. Another random shot of the river. The population in town was only 3 today. At the south end of the town, I didn't find any rusty goats but we did see some rusty trucks. This old Chevy is pretty cool, I bet I could fix it. We finally made it to the Opal Pool and just in time for lunch. Opal Pool Falls. After lunch and taking in the scenery we headed south to see Flume Creek. The trail runs up the west side of Opal Creek and Flume Creek is on the east side so a bushwhacking we went. We made our way to the creek and it looked like just a couple of short drops into Opal Creek.I climbed up the hill a little way and found a much larger drop. Flume Creek Falls. By the time we got back to Jawbone Flats we realized we had to get heading home and we were pretty tired. Lucky for us there was a magic mine cart nearby that we were able to ride back to the trail head. Good stuff. The Evans Creek area caught my attention several weeks ago, because that was one section on Google Earth that got updated with Lidar data. The canyon where the mapped falls is situated definitely looks gnarly and it definitely looks to me like the best route in there would be to come up the creek from downstream in the summer - maybe about 3/4 of a mile from the easiest point on the road to drop down. HOWEVER...there are TWO more significant falls on Evans Creek downstream from there that look a HELL of a lot easier to get to (and possibly two more smaller ones as well). 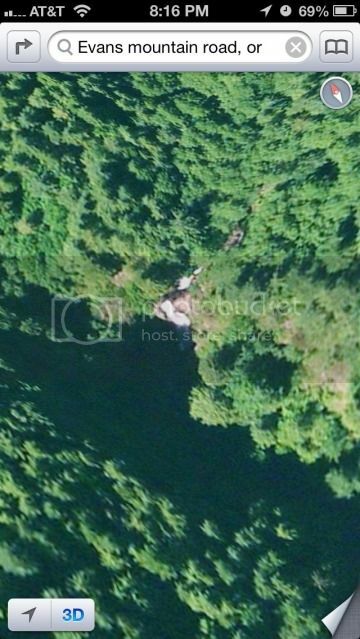 Upper one is at (44.84527, -122.36486) and might be close to 90 feet tall itself, the lower one is at (44.84346, -122.3639.) and looks like about 50 feet tall. Should be able to use the same jumping off point to access both of them too as they're only about an eighth of a mile apart. There also appears to be one on Dry Creek about a quarter of a mile above the road just past the Henline Falls trailhead that should be fairly easy to access. Consider me you guy's biggest fan! That stone arch at Triple Falls is excellent. Good work on all of these. Thanks for the compliments and for the heads up on the lower falls on Evans Creek, Bryan. This area is pretty awesome no matter what kind of hiker you are...there's a lot to see and enjoy. Tim, I decided to grab a couple screen shots of Evans Creek. The upper one looks much much harder to get to. Was the upper one the one you guys went to? Greetings! I recently visited Triple Falls via the North Little Santiam trail and employing some tree climbing skills from my youth to get to the river. Right now it's more of a Triple Trickle but I would like to find a better route to it while it's dry and then revisit when the falls are more showy. If I read the description correctly, you found a way down on the west side of the creek, as in the far side of the bridge over Henline Falls. I realize this adventure was five years ago but thought it was worth a shot to gain some information. Thanks!